So you are reading this article!? That means you need to buy a battery for your boat. There are a number of factors you need to consider before buying one. A marine battery defers from your regular car battery in the way it discharges its current. While the car battery used to crank the car engine discharges a large burst of current for less than 30 seconds, the marine battery discharges smaller currents continuously for an over 2 hours. Unlike the marine battery, however, the car battery must always not discharge below 75% of its total capacity before charging again. The marine battery, on the other hand, can discharge up to 45% of its total power before charging again without negatively affecting its lifespan. That is an important characteristic of the marine batteries, and it’s referred to as a deep cycle. Yes, it is hard to select a perfect battery for your boat. But don’t worry, I’m here to help you with a proper guideline. You just need to go through the guideline carefully and pick the suitable one. 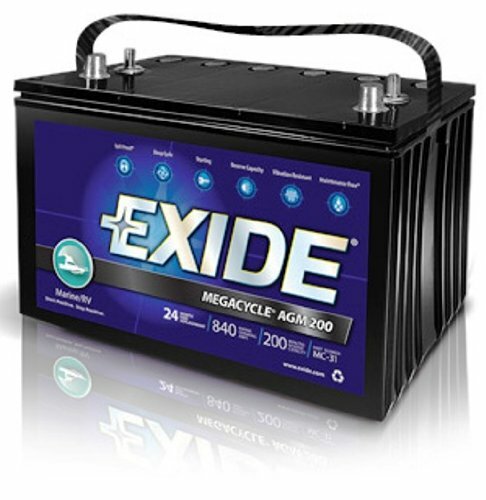 The Exide XMC-31 battery weighs 74.6 pounds, and measures 15.7 inches by 13.9 inches by 9.8 inches. It is rated 925 CCA at 0 degrees Fahrenheit, and 111CA at 32 degrees Fahrenheit. It is reserve capacity is 200 minutes, and it has a dual terminal design. It has an absorbed glass matt separation. The top marine batteries list wouldn't be complete without it. It can crank for 30 seconds, giving out 925 Amperes without its voltage dropping to 7.2 volts, at 0 degrees Fahrenheit. It is also capable of cranking for 30 seconds, giving out 111 Amperes without dropping below 7.2 volts at 32 degrees Fahrenheit. With a 24 month free warranty, you can be sure that you have a quality product. With a reserve capacity of 200 minutes, it can discharge 25 Amperes for 200 minutes, even when operated at 80 degrees Fahrenheit without its voltage dropping below 10.5 Volts. It is 12-Volt, 750 Cold Cranking Amps. This battery has a rating of 12V and CCA 750. It measures 10 inches, by 6 and 7/8 inches, by 7 13/16 inches tall. It weighs 43.5 pounds and has a stainless steel casing. It has an RC of 120 minutes. It is 15 more resistant to vibration. If you are looking for the top starting and deep cycle marine battery, this will definitely be on the list. The above item can be operated for 30 seconds while delivering 750 Amperes, without the voltage dropping to 7.2 volts. With a reserve capacity of 120 minutes, it can be operated for 120 minutes, while giving out a current of 25 Amperes without its operating voltage dropping to 10.5 volts, even when the temperature is as high as 80 degrees Fahrenheit. That is two full hours of heavy continuous use of in your boat. This is Maintenance Free Operation. VMAXTANKS Vmax857 is contains Absorbed Glass Matt between the plates and does not contain a liquid electrolyte in the sense of the lead-acid batteries. It is does not spill the electrolyte and its non hazardous. It can recover easily from deep discharge. They are rated 12V 35AH. This battery can continuously out a maximum of 35 amperes for one full hour. If the amperage is half, the duration will be extended to two hours. The operating voltage will not drop below 10.5 volts during that time. It is sealed and does not therefore need maintenance nor does it spill the electrolyte when tilted. It is shock resistant because it uses the Absorbed Glass Matt between the plates. The Interstate Batteries (AGM) - DCM0035 is sealed. It measures 7.9 inches by 6.10 inches by 5.13 inches. Is made in USA and has a rating of 12 Volts 35 AH. It comes with a 30 days return policy and a 12 month exchange policy. The above battery can provide your equipment with 35 amperes for a full hour without the voltage dropping below 10.5 volts. If it fails to do so, you can return it and get a full refund, if you do it within 30 days, or you will get an exchange if you return it within twelve months since the day you bought it. This battery SLA/AGM maintenance free & spill proof. 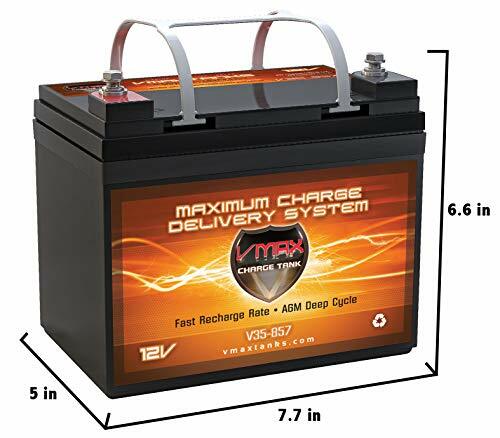 The Mighty Max Battery 12V 35AH Wilderness Tarpon is a sealed battery. It weighs 24 pounds and its rated 12V 35AH. It can be used by scooter, UPG, Alarm, and Wheelchair battery, and boats. It weighs 23 pounds and measures 7.68 inches x 5.16 inches x 7.13 inches. It can be used continuously for an hour, while providing a current of 25 amperes without the voltage falling below 10.5 volts. It can power your boat’s instruments for over two hours if the items are not collectively drawing over 12 amperes. It can run a 55 pound motor with four people on board for 45 minutes at full speed. 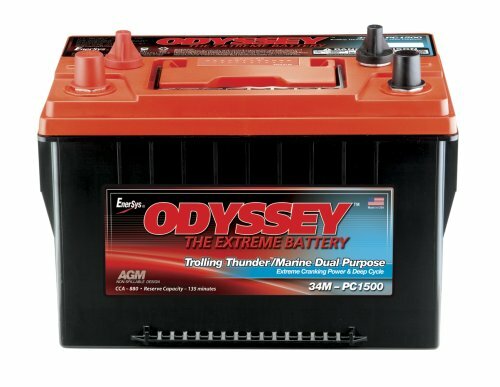 Odyssey 34M-PC1500ST has a Cold Crank Ampere (CCA) rating of 880. Its plates contain the Absorbed Glass Matt between them. It is sealed and can operate between a temperature of -40 degree Fahrenheit and 176 degree Fahrenheit. It can be stored for up to 2 years or 12 volts. This is a low maintenance battery that is resistant to vibration and spillage. It can start your boat’s motor even at a temperature of zero degrees Fahrenheit. It can supply a voltage of over 10.5 volts for 880 Amperes for 30 seconds. It has 2 years of shelf life, which means you can comfortably use it and store it as long as the voltage does not drop below 12 volts. It is a deep cycle battery. 8mm HEX screw in terminals: included. Vmaxtanks MR107 measures 10.2 inches in length, 6.6 inches in width, and 8.3 inches in height. It contains an Absorbed Glass Matt between the electrode plates and it is sealed. It is rated 85AH. It can power 40 to 55 pound motor for up to 10 hours without its voltage dropping to 10.5 volts. It has a deep charge cycle of between 50 to 60 percent. This marine battery can be used continuously for an hour while supplying your boat with an 85 ampere current. It does not spill the electrolyte since the AGM holds the electrolyte. That also makes it shock resistant. Which means its performance is not affected by normal operation shocks. Its deep charge cycle is suitable for prolonged marine use where it’s not possible sometimes to charge it regularly. Up to 145 minutes of reserve capacity. 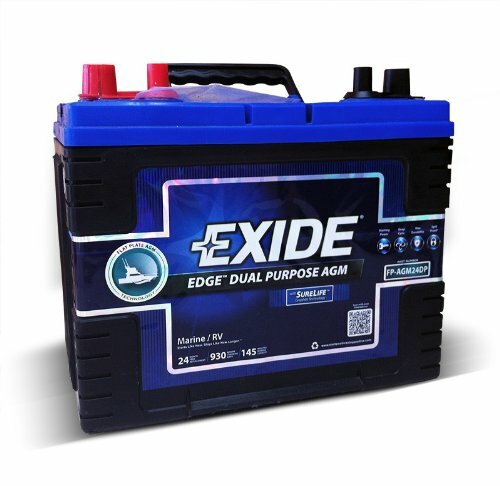 Exide Edge FP-AGM24DP has a rating of 775 CCA, 140 Min RC at 25 A. It has an Absorbed Glass Matt between the electrode plates. This is one of the best marine batteries and weighs only 50 pounds. It measures 10.2 inches by 6.8 inches by 8.7 inches. It is made in the USA. This battery is designed for marine vessels. It can crank a motor for 30 seconds, supplying a current of 775 amperes without the voltage dropping below 10.5 volts. It has a Reserve Capacity of 145 minutes which means it can supply a current of 25 Amperes for that long. That is enough to power your boat for over an hour as well as drive the motor. Optima 8027-127 D27M is lead spiral design and it is vibration resistant. It uses solid cats cell connections. The cells are tightly compressed and it is made in USA. It weighs 53.8 pounds and measure 12.2 inches by 6.8 inches by 8.7 inches. It has a rating of 800 CCA and 1000 CA. When fully charged, it has voltage of 13.1 and a nominal voltage of 12 volts. It has a reserve capacity of 140 minutes. 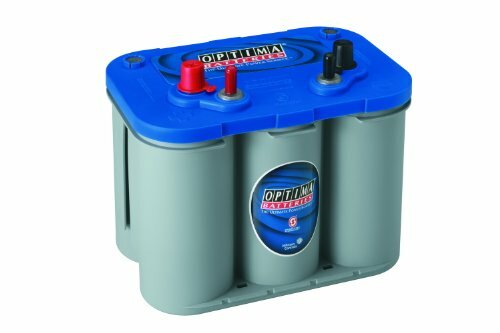 If you are looking for the right marine battery, consider this one. This is one of the best starting and deep cycle marine battery. It uses cell spiral technology to increase resistance against shock. The close compression of cells also increases the battery's resistance to shock. It can supply 800A at a temperature of zero degrees Fahrenheit, and 1000A at 80 degrees Fahrenheit for 30 seconds before the voltage drops to 10.5 volts. Dual SAE & 5/16" Stainless Steel Stud Posts. 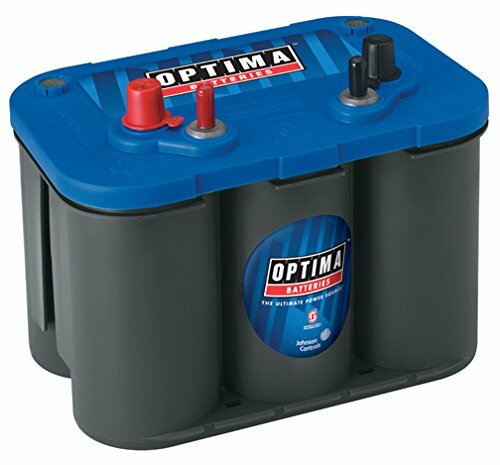 Optima Batteries 8006-006 34M uses Spiral cell technology. It has a rating of 800 Cold Cranking Amps, 1000 Cranking Amps, and 12 Volts Nominal Voltage. When fully charged and not connected to a circuit, it has a voltage of 12.8. It has an internal resistance of 0.0030 ohms. It total capacity is 50Ah with a Reserve Capacity of 100 Minutes. If you are looking for the perfect marine battery in the industry, it is one of them. Its spiral technology makes it highly resistive to shock. With a cold cranking of 800A, it can supply a motor with 800 amperes for 30 seconds, at a temperature of zero degrees Fahrenheit, without the voltage dropping to less 10.5 Volts. At a temperature of 80 degrees Fahrenheit, it can supply a motor with 1000A, without dropping the voltage below 10.5V for 30 seconds. This marine battery is also capable of supplying 50A for one full straight hour without its voltage dropping below 10.5V. ​Yes, you can. These batteries can be used for both cars and marine boat. But you can get the car’s battery in cheaper rate than the marine battery. You can also use these batteries for others uses besides cars and marine boat. Are they dual purposes batteries? Do I need to buy anything extra? 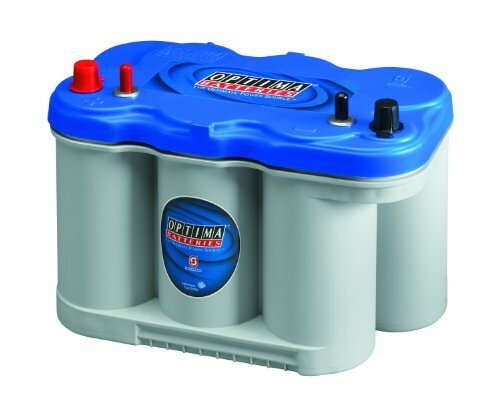 ​These batteries have dual terminal so you can use it for both automotive and marine without buying anything extra. Do I need a special battery charger for charging it? ​No, you don’t need. But always try to use an auto current limiting charger. It’s better for the battery. Always try to charge your battery regularly. Do not charge whenever you want. Continuous charging helps to keep the battery performance for longer. Do not overcharge your battery; do not charge the battery with high or low voltage. 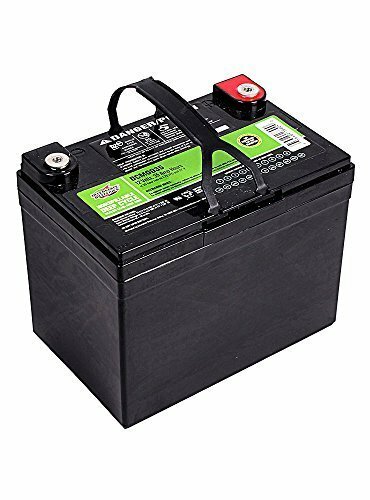 If you use lead acid battery, check the water level of the battery in time. Use only distilled water and avoid using tap water, or the battery acid that is found to buy at local automotive stores. Always wear eye protection when you change the acid. Do not leave your battery in high or low temperature. It may decrease the performance. When you leave your battery idle, keep ongoing the tackle charge. It is the best way to keep the battery workable. Charge your battery after each use, regular charge helps to keep the performance for a long time. When you find dust in the battery, clean it properly. Breaker and fuse are also important about your battery’s performance. Always try to use the recommended breaker and fuse. When selecting the perfect marine battery, Application and Construction of the batteries are the two main factors we consider. We use these factors as a standard against which all marine battery products are compared. This method ensures that we not only get the best marine battery, but also those that perform a particular task better than the rest. It is important to keep in mind that the best marine starting battery cannot be the best deep cycle marine battery. Why? Because these two types of marine batteries are better at performing different functions. You may wonder what if you want batteries that can perform both functions. You have to settle for a Dual-purpose battery. A dual-purpose battery balances between giving high charge bursts for a starting a motor and discharging deeply to power devices for prolonged times. Each marine battery will be used as a single battery or a battery bank in your Boat or Recreational Vehicle, (RV). However, they will fall into three main categories. These are the batteries that allow you to power your on-board equipment. A deep cycle marine battery discharges small currents for an extended period. You can use until it discharges down to 45% of its total capacity before you can recharge. That is the lowest discharge capacity the best marine battery can achieve before its cells get damaged. A deep cycle marine battery for trolling motor also recharges much faster. It can charge up to 100% of its total capacity in 2 hours. The best deep cycle battery for trolling motor should be able to meet the above characteristics. A starting battery is designed to discharge huge bursts of current to crank your boat’s starter motor. The discharge period is in the range of 15 to 30 seconds. Within that short period, it should be able to fulfill about 800A, before its voltage drops below 10.5V. The voltage must not drop below 10.5V; otherwise, the battery will not be able to spin the motor properly. Most motors need a current of at least 10.5V for that to happen. The large burst of current is what makes the starting motor turn at very high speeds and successfully crank the boat engine. Sometimes you may have a boat or RV that uses only one or two batteries. In such cases, you need to get a compromise between a deep cycle battery and starting battery. That way, you can use it to start your RV or marine boat, and still be able to power your on-board devices. These batteries have lower storage capacities than deep cycle batteries and lower discharge currents than Starting batteries. They are best suited for small sailboats, RV battery banks, and marine boats with few and low powered equipment. 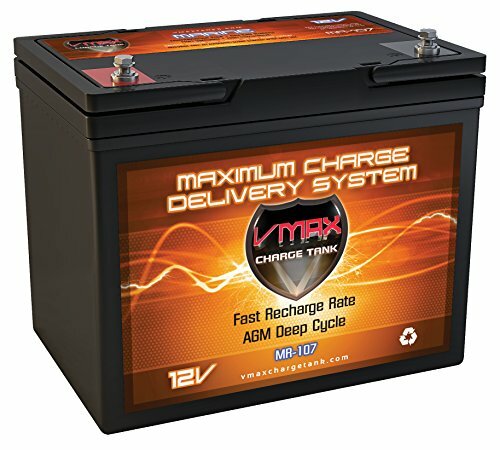 These are excellent deep charge cycle marine batteries. They can discharge up to 100% without damaging their cells for up to 800 times. They are suitable for high-performance battery tasks. You can have a (LiNMC) battery tank and install a high output alternator. That alternator will allow you to run your diesel engine for a short period to quickly charge the heavy load of (LiNMC) marine battery bank; something diesel engines are good at doing. These batteries are deep cycle marine batteries. You can discharge/charge them for 400 cycles with a depth discharge of up 80%. They can accept a much higher amperage charging current for due to their pure lead with lower resistance, and thinner lead plates, which increase their surface area. These have a reservoir where an electrolyte is held. The electrode plates are then positioned inside the electrolyte. They need to be placed on a stable surface to avoid shocks. They are the best marine batteries regarding the initial cost of purchase, being very cheap. They are capable of about undergoing 500 to 1000 complete discharge and charge cycles. They must be kept upright always and require regular maintenance. You have to top up the electrolyte with distilled water and recharge them periodically. They discharge at a rate of 6% to 7% per month when in storage. They must be installed in a well-ventilated environment because they discharge oxygen and hydrogen, hydrogen being explosive. Gel marine batteries are sealed, and valve-regulated (SVR). They do not need any maintenance as the gasses released can recombine whey they exceed a certain pressure. Their valves open to allow the gasses to recombine or release the gasses if there is a need to. They are spill-proof, leak-proof and can be submerged without being damaged. They, however, need to be smart charged to prevent damage since they are sealed and manufactured to high standards. They the most common marine battery construction. They have an Absorbed Glass Matt between the electrode plates. The AGM absorbs the electrolyte and supports the plates to make them shock proof. They contain precision valves that allow the hydrogen from the negative plate to recombine with oxygen from the positive plate. They are the best dual-purpose batteries. They can discharge down to 55% of their total capacity, and recharge much faster than conventional batteries. They have a long life due to a low discharge rate of 3% per month. It is the best marine battery for trolling motors. It can give you a longer discharge period. That is the only way you will be able to operate your trolling motor for hours without recharging. The deep discharge cycle without damaging the cells gives you the ability to use them as battery banks. Short discharge cycles on the other hand would require that you frequently charge the batteries. RM is the length of time in minutes that a battery can supply your boat equipment with 25A, without its voltage dropping below 10.5V, at a temperature of 80 degrees Fahrenheit. The rating is indicated as 200RM, Where 200 is the number of minutes. 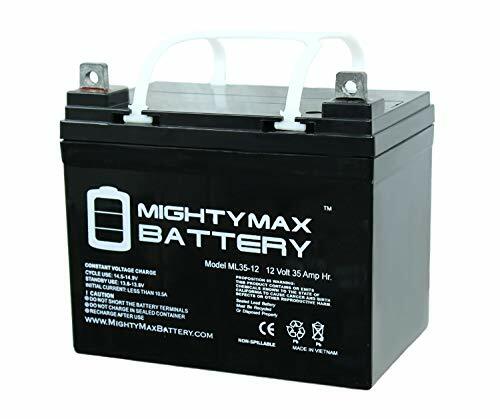 The size of your motor, which is indicated in Watts or Voltage Amperes (VA) is critical in the type of battery you buy. A battery can only support your equipment if the current drawn is within its discharge capacity without ruining the cells. A marine battery with a rating of 150RM will discharge faster than one with a rating of 250RM. CCA or Cold Cranking Amperes is the number of Amperes that a marine battery can deliver for 30 continuous seconds without the voltage dropping below 10.5 Volts, while operating at a temperature of Zero degrees Fahrenheit. The MCA or Marine Cranking Amperes is the number of amperes a marine battery can discharge continuously for 30 seconds without its voltage dropping below 10.5 Volts. The MCA is always higher than CCA because a battery operates better at higher temperatures. It is one of the best baselines for comparing marine batteries to find a marine battery that is best for your money. The longevity of a battery is measured in life cycles. A lifecycle that is close to 1000 lifecycles or more is the best. This rating is achieved by charging a new battery to full capacity, then discharging it under controlled conditions till the voltage drops to 10.5 volts, at a temperature of 80 degrees Fahrenheit. They repeat it until the marine battery can no longer hold half its rated capacity. Any marine battery review to find the marine cranking battery, dual purpose marine battery in 2018 should take this rating into consideration. The Deep cycle feature can be measured in Ampere-Hour (AH) or Reserve Minutes (RM). While the RM is the amount of time in minutes a marine battery can discharge a current of 25A without the voltage dropping below 10.5 at a temperature of 80 degrees; the AH is the energy a marine battery can discharge current continuously for 20 hours without the voltage dropping to 10.5 Volts. Always use the charger provided by the manufacturer to charge your battery. This will help you to avoid the possibility of a damaging unit. Recharge the battery immediately after every use. Clean the terminals using a thick solution of baking soda and water. It will keep aya corrosion from the battery. Maintain proper water level for flooded batteries. When choosing marine battery for your marine boat, your recreational vehicle (RV), or trolling motor, the crucial factors to consider are the duration of use before recharging, discharge capacity, and longevity. Those factors will help you to estimate how much load your battery can support for a specified period, how deeply you can discharge the marine battery without damaging its cells, and its life cycle. With those features in mind, you will never go wrong when choosing a battery for your boat. So take note of the above features, select the one with the features you were looking for and you’ll get the best marine battery for your boat. 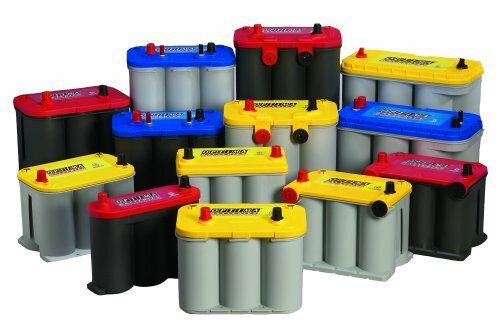 Can I use a deep cycle battery as a starting battery? You can use a Deep Cycle battery as a starting battery as long as you are taking under consideration the lower CCA of a Deep Cycle battery. As a rule of thumb, it is a smart plan to upsize the battery by concerning 20% to deliver an equivalent quantity of cranking amps from a deep cycle battery.